“Brazil is like a dream, I’ve never seen anything like this before, the entire landscape covered of sugarcane is beautiful,” says Jaswant S. Rai, president of the West Kenya Sugar Company plant in Kenya, Africa. 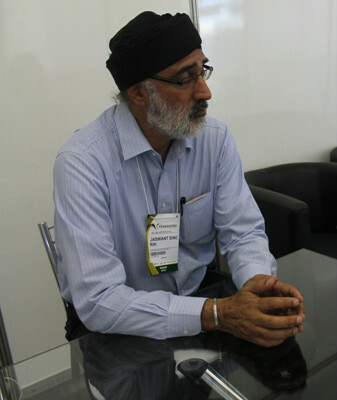 Rai could see firsthand, on his first visit to Brazil, the machines and the technology behind the production of ethanol in Sertaozinho, SP, during Fenasucro 2013, held from 27 to 30 August. Plus the opportunity to do business with Brazilian companies, the Kenyan hopes to take what they absorbed the experience to meet the domestic industry for your country. He admitted that although Brazil is far ahead in the development of technology for the production of sugar and ethanol, India takes lead in partnerships with Kenyan plants due to greater proximity to the African country, as well as speed in shipping. “We negotiate sugar production technology with the Indians for a long time. Kenya now has 11 plants that produce only sugar. The Industry crushes about seven tons of sugar cane per day, bought from small producers with two hectares plantations “he said. Rai pointed out that with the support of the Kenyan government – who suffers from the shortage of resources – is expected to begin producing ethanol soon, which should contribute to the country’s economy. “We want to produce ethanol in Kenya and some laws relating to politics in this sector will take some time to be implemented there. But the future is promising for ethanol in the country, rely on the producers and the government,” he said.